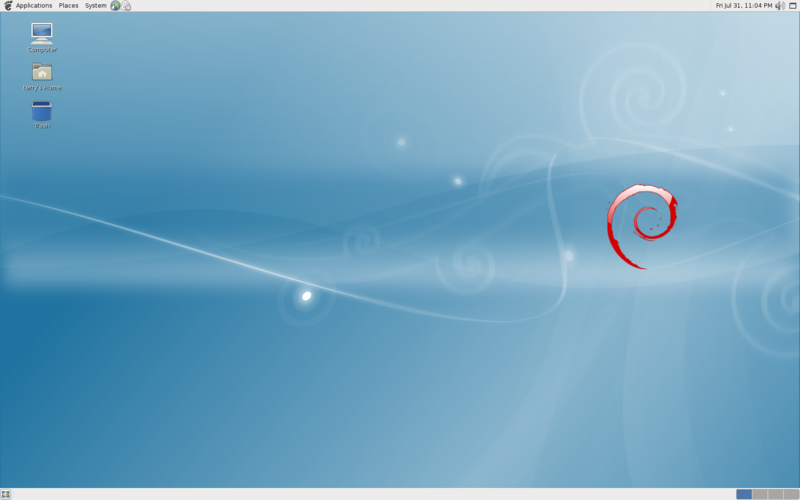 I’m looking for commercial dvd playback on my Debian lenny desktop. Let’s see if this works. The above command is one long command with no spaces. This wordpress page puts it on 2 lines…….it’s only one command. Once again, that is one long command. Or, if you would rather install these through synaptic, You can close the terminal and add these through the synaptic GUI program. They both will work. The install went good, no errors……until. The Debian update manager(GUI) gave me a smart upgrade option because of some new dependencies for some new applications or newer versions of existing dependencies. I opted for the smart upgrade. During the smart upgrade I got a notification that the mplayer.conf file would be replaced with a new conf file. I was asked if I wanted to keep the old one or write the new one. I choose to write the new one. It works. Nice. Well…It didn’t work on a new release (Transformers 2), but It did work on dvd’s that were a little bit older. Probably encryption issues. The following was done after I set up Debian. See my previous post. The Nvidia site says I need the 185.18.31 driver. I’m installing an older 173.14.09…. driver because that’s what’s available in the repos. You can install the 185.18.31 driver the Nvidia way but that’s much more involved. If I’m unhappy with the 173, I’ll do the 185 by hand. Using X configuration file: “/etc/X11/xorg.conf”. At least one Device section is required. I then rebooted. I got the NVIDIA splash screen during the boot. Your resolution should be set to auto which is the native resolution of the monitor. With the next command, you should be able to change that. 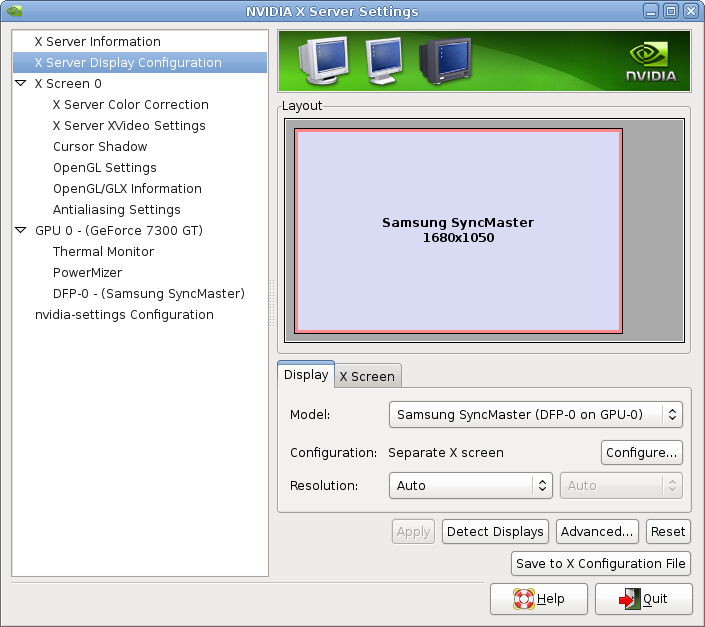 At a terminal type: $ sudo nvidia-settings to get to the NVIDIA X Server Settings window (GUI) to adjust settings. Everyones happy…. I hope. A Monitor out of range error is a HorizSync VertRefresh issue. adjustments…or you might have installed the wrong driver. Doh! Ok. A fresh install of Debian Lenny. I used the net install. I started the install and let it do it’s thing. It took about an hour and a half with my connection. I went and watched Bourne Supremacy while it was installing. I’m not going to go over the install. There are a bunch of guides and examples on the net Here’s a link to a quick over view. Remember, you do want the base system and desktop environment installed. First thing I want to do is add myself to the sudoers list. This is how. Then type in the root password. Now you can add a username to the list. Now press Ctrl+X and press Y when prompted to save. Then press enter. Now you should be on the sudo list. This will also mount external hard drives formatted as NTFS. To do this we must add backports. Here’s how. Add this to the source list. Now the backports work. Lets install flash. Now you are officially a freedom hater. Congratulations.